With pizza, we’re going to work backwards. First, let’s talk toppings. Then, in a couple of weeks, we’ll talk dough. But first a question: Is pizza the perfect food? Mix part of your daily serving of carbs with tasty sauce, gooey cheese, vitamin-packed veggies and your favorite source of protein. What’s not to love about pizza? And we definitely love homemade pizza. It’s great to order in from time to time, but all too often, Stacey finds that delivery has too much sodium, keeping her thirsty all night. Or maybe she’s just getting old. Anyway, homemade pizza is quick, easy, delicious, and made to order. Of course, it’s also healthier! The Crust: Store-bought dough or crusts can be a good option. Trader Joe’s bagged whole-wheat dough in the refrigerated section is tasty, relatively inexpensive and easy to spread out on the pan or Silpat. If you’re using whole wheat crust, you’re on your way to making half your daily grains whole. The Sauce: Get it in a jar or add some Italian seasoning to a homemade or canned tomato sauce. And if you’re feeling up to it, chop some fresh tomatoes and season as you like with garlic, basil, oregano, thyme, red pepper flakes, etc. Both fresh and canned tomatoes and sauces are great sources of Vitamin C. For a white pizza, think part skim ricotta, or a jarred Alfredo sauce, keeping in mind this will likely boost the total fat. The Cheese: Reduced fat is delicious and flavorful, and helps cut down on total fat. Fat free cheese however, is another story – usually tasteless and rubbery – no thanks! And please, think beyond mozzarella! Mix it up a little bit and try lower-fat versions of cheddar, provolone, Parmesan, fresh mozzarella, smoked Gouda and even Muenster! Two cups of shredded cheese should suit a 16 inch crust, depending on how much you enjoy cheese. The Protein: For Samantha and Stacey’s husbands, meat is their raison d’être. So no pizza is complete without some pre-cooked shrimp, chicken, meatballs, ham, pepperoni (turkey or regular)…oh, the possibilities! Need a meatball recipe? This one from Everyday Food was simple and tasty. Because lean protein is satisfying, we’re less likely to overeat and our husbands are more likely to consider pizza a meal in itself. The Veggies – the possibilities are endless! Mushrooms, onions, peppers (red, green, yellow, hot or mild), broccoli, shredded carrots, spinach, and the list goes on. 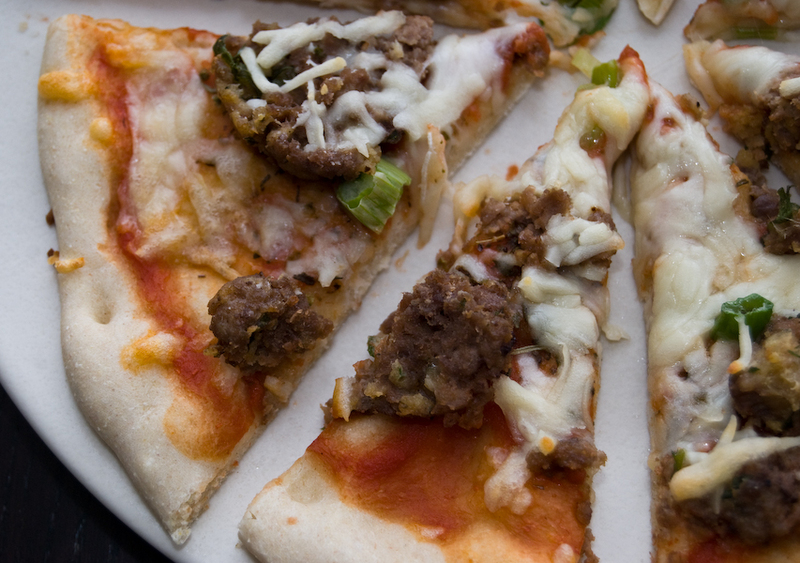 Parents often sneak veggies into their kid’s diets in places like hidden pizza toppings. What an easy and fun way to work in at least one serving of veggies for the day! How Stacey got the shot: On the dining room table with the Nikon D40, lighted naturally. ISO 400, focal length 55 mm, aperture f/5, exposed 1/60 second. And have I mentioned that I almost ALWAYS shoot in Camera RAW? Booze! Yep, that’s right: Booze! Great entry! I love whole wheat dough. Buying it pre-made is fine, but I have a great and easy recipe to make it yourself from scratch. I just made it a few weeks ago using whole wheat flour, and topped it with part skim ricotta, spinach, and bocconcini. Let me know if you’d like the recipe to try it yourself sometime!